Makita RT0701C should be an option for any person looking for a router for light routing jobs. Strongly built and equipped with necessary features, this product delivers easy, accurate, precise and flawless cuts. Though it is available in a compact and lightweight design, it has stunning versatility as it can be used on a wide range of job sites and for different applications. Operators enjoy comfortable and enhanced control which makes routing and cutting with the tool to be a breeze. It also has an ergonomic design and comes with basic features as well as accessories that make routings comfortable such as offset base, edge guide, carrying/storage bag, dust/chip nozzles, template guide, and others. But you will be mistaken to think that RT0701C has no flaws in its design, performance, and construction. This piece takes a look at the features, pros, and cons of this product. If you are looking for the best router and router table then this is the best choice for you. 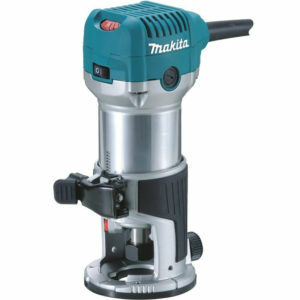 This Makita router is fitted with a motor of 6 1/2 amp which has a horsepower of 1-1/4. Considering its lightweight and compact size, the horsepower is ok. The motor spins at a good speed varying from 10,000 to 30,000 RPM. Given its variable speed control dial, operators are able to adapt the speed to suit their workpiece. To gain a more professional and standard finish, this model of Makita router also delivers a linear speed using the special electronic speed load circuitry it comes with. This feature which is one of the strong selling points of the brand also helps to improve the accuracy of the machine. RT0701C comes with a fixed base plate. However, if you like, you can purchase and use the plunge base on it to make your product more versatile. The router is designed in such a manner that industry standard template guides can be used on its base. The router comes with 1/4 collet bit size which is the ideal for a general routing purpose. However, 3/8 inch bit size can also be used on it, but never the 1/2 inch size. Bit changes can easily be effected with the spindle lock it comes with. However, operators that are not comfortable with the spindle lock, can use the wrench included in the package. Depth adjustments can easily be achieved with this product thanks to its quick cam lock system. The motor unit is pushed up and down by the router’s rack-and-pinion mechanism moved by a knob. Operators have to open the lock level and move the cam up or down in order to achieve depth adjustments. For more details check out the best wood router for the money article. It is light, small and easy to work with. It is strongly built and fitted with basic features. It features a soft start motor. The fence is not only functional but also sturdy. The power switch does not have any dust shield and thus can easily spoil owing to the accumulation of dust. The sight lines are not very efficient. It cannot be used to accomplish heavy task owing to the size of the base. The RT0701C wood router is a well-built router available in the slim design. It can only handle light woodwork and thus, it is not an option for people engaging in heavy cutting or routing tasks. But this is not a problem as it is designed for casual routing jobs and work around the house. Besides, it is sold at a very good price.